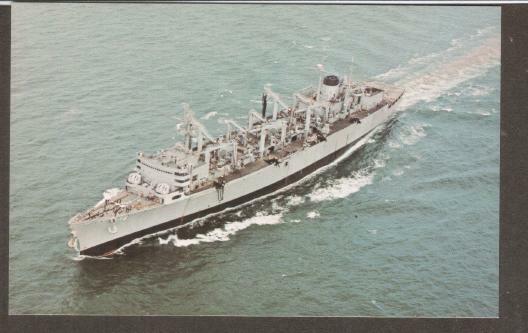 The USS DETROIT (AOE-4), a Sacramento-class fast combat support ship, was commissioned on 14 MAR 1970. Built in Bremerton, WA, DETROIT sailed to her first duty station of Newport, RI via Cape Horn. USS DETROIT "turned to" with deployments to the Mediterranean, North Atlantic, Carribbean and Persian Gulf through out her career. First from Newport, the Norfolk and finally from NAVWEAPSTA Earle, NJ, DETROIT supplied the fleet, always true to her motto, "To Surpass the Finest". USS DETROIT served her country for 34 years, 11 months and 3 days, until decommissioned on 17 FEB 2005. Initially laid up at NISMF Philadelphia, she was scrapped in October 2005.